Olentangy’s Kristen Kracht, left, fires up her teammates after opening the seventh inning of Wednesday’s Division I regional semifinal with a lead-off double. Gahanna’s Molly Troutman was covering the bag on the play. 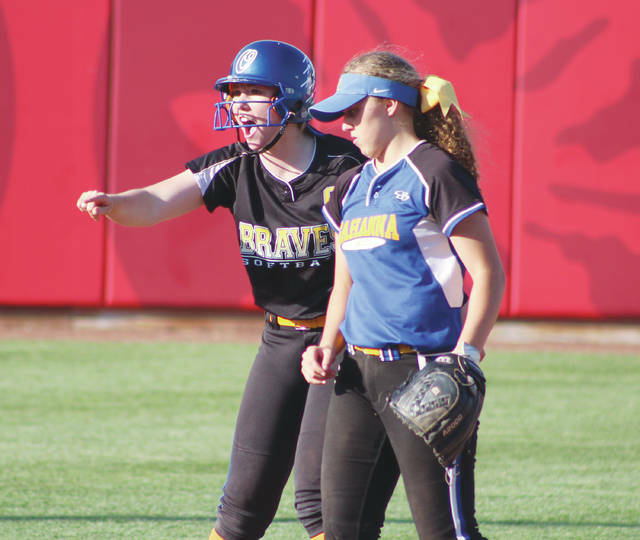 Junior Brooke Wells channeled some anger into a walk-off single in the seventh inning to cap a comeback victory for the Olentangy softball team. Kirsten Kracht had two hits, including a lead-off double in the seventh. She scored from third on Wells’ walk-off to give Olentangy a 5-4 win in a Division I regional semifinal Wednesday at Ohio State’s Buckeye Field. “I’m not going to lie – I was mad,” Wells said. She knew all she had to do was hit it by the drawn in infield. “I saw that pitch and went outside with it and took it to left-center,” Wells said. Emily Gernert and Olivia Gregory were each intentionally walked after Emily Bullock moved Kracht to third to set up Wells’ hit. Olentangy (19-11) never led until it counted, trailing by as much as three runs after Gahanna scored three in the fifth inning on a Caroline Heller RBI single followed by an Ale Nye pinch-hit, two-run single. Kracht was hit by a pitch with the bases loaded and Bullock followed with a sacrifice fly in the bottom half to get the deficit a little more manageable. Payton Cox drove in Gregory with a two-out single in the sixth to tie it 4-4. Sophie Low went the distance to get the win in the circle for Olentangy, dancing in and out of danger all day. She set down the side in order just once. But, she didn’t allow a hit after Nye’s two-run single in the fifth. Some of that danger was self-inflicted. She intentionally walked Addie Kittel three times after she hit a solo home run to give Gahanna a 1-0 lead in the third, including with a runner on first and no outs to start the three-run rally in the fifth. All told, Low allowed four runs (all earned) on six hits, seven walks and two hit-batters and struck out five. Low also had a team-high two hits. She led off the fourth with a base hit to set up a Gernert RBI single that scored courtesy runner Maddy Beachley to tie it 1-1. Kittel went the distance for the Lions (20-9), but was saddled with the loss. She allowed 10 hits, two walks and a pair of hit-batters and had three strikeouts. Audre Ledbetter led Gahanna with two hits. Olentangy faces Teays Valley for a regional title at Buckeye Field Saturday at noon.